Over 50,000 people around the nation took part in the 6+ hour event that stretched past midnight. Part of what makes Secret Church so cool is that most everyone is experiencing the event and praying at the same time. This is especially cool when you go on social media and connect with others participating and see what parts touched their hearts the most. In case you couldn’t make it, or in case you were too busy filling in the blanks on the study guide to go online, here are some tweets that I retweeted and favored during the event. “@Secret_Church: "Marriage exists for God more than it exists for you.” @plattdavid #SC15” So are you honoring God in your marriage? Of course, you can’t have a late night event without going a little silly! Here are some of the funny tweets! Since that dark day when the Lord and Master of all life (Colossians 1:15-19), Jesus Christ, was crucified on a Roman cross, we’ve tried to subtly pass the blame for the death of Jesus onto the whole of humanity rather than on ourselves. I know that may sound strange, but the reality is that we don’t allow ourselves to linger on the thought of Jesus suffering and dying a brutal and excruciating death FOR ME and BECAUSE OF ME. It’s much more bearable to think about Jesus dying for “people”, or for sinners (in which we include ourselves). But to stop for a significant amount of time and consider the depth of what Jesus endured; he was mocked, beaten, scourged, and crucified all for ME, it is almost too much to bear. When I say “me”, I’m talking about the real person that I know the best; the person that I see in the mirror and who knows he has sins deeply rooted in his heart and who spends a great deal of time trying to cover it up and hide it behind religious behaviors and a nice smile. It is because of me and it is for me that Jesus died. While the death of Christ Jesus purchased my pardon and set me free to know God and to love God, I shudder to think that it was because of my sins that Jesus was nailed to the cross (Colossians 2:14). When I hear the words “Jesus died for sinners”, I say to that “Yes” and “Amen”, because it is true and because I find such deep and abiding joy in those words. But there are times when hearing the words “For he [God] made him [Jesus] to be sin who knew no sin, so that in him we might become the righteousness of God”, I grow hauntingly quiet. It is a somber, convicting, and piercing truth (2 Corinthians 5:21). God made Jesus to suffer for me and because of me so that I could know life in him. This is the message that transforms lives and the message we boldly proclaim. As we enter the month of April, I was reading through the passion narratives that document the events of Jesus final hours, this verse in Luke 23:25 jumped off of the page at me. I’ve known for most of my life that Jesus was crucified and Barabbas the criminal was let go by Pilate. 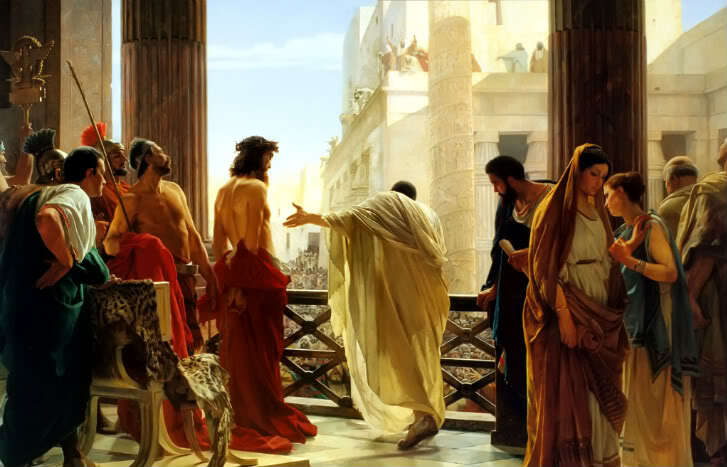 By Pilate’s authority and by the urging of the Jews, the man who had been convicted and sentenced to prison and death for insurrection and murder was released by Pilate. And in the place of the murderous rebel, Jesus Christ stood condemned and was sent to Calvary to die. This “trade” that the Jewish leaders made with Pilate was not an isolated event outside of the sovereign will of God (Isaiah 53:10). Nor is it unconnected to the impact of the crucifixion on my own life. See, Jesus took the place of a condemned man. One who was obviously guilty and deserving of death according to law was pardoned (or set free!) while the blameless and perfect Son of God was sentenced to die. My propensity to pass the blame for Jesus’ death onto all of humanity comes quickly to an end when I realize that I am Barabbas. No, I have not been convicted or even accused of murder and insurrection according to our civil laws; but according to the law of God, I am a murderer and an insolent rebel against God’s moral law of perfection (1 Timothy 1:13-15). I have transgressed against his holiness too many times to count, and I am deserving of the most terrible kind of death. But God saw fit according to his perfect and sovereign will to make provision for my sin wrecked soul. Instead of giving me over to eternal death, he extended mercy to me and gave me life (1 Timothy 1:15-16, Ephesians 2:4-5). This life comes by the death of his perfect Son Jesus. I was guilty and Jesus was innocent, but Jesus was crucified as a guilty criminal (Isaiah 53:3). I was to blame for my wretched sin and Jesus was completely blameless, but Jesus died taking my blame upon himself. I was a murderer who harbored hatred in his heart (Matthew 5:21-22), but Jesus was hated in my place (John 15:25). I was on the path of death, but Jesus died in my place, for me and because of me, so that I could be set free to know life abundantly. Just like Barabbas, Jesus was delivered over to be crucified and I was set free. This Easter, would you consider the cross deeply? Will you spend significant amount of time thinking on what Jesus did for you by dying in your place and absorbing the wrath of God that you greatly deserved? Would you just stop for a few moments and ponder the depth of God’s grace and mercy to save your soul? I pray that your worship, prayers, and fellowship with believers will be greatly encouraged as you think deeply on the implications of what Jesus has done to give you life eternal. We will be celebrating on Easter Sunday the glorious and miraculous resurrection of Jesus Christ, the Lord, Master, and King of all creation. 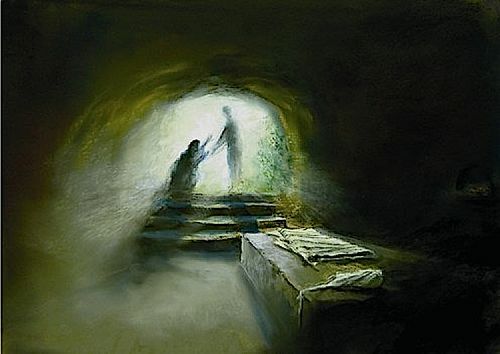 But to get to the empty tomb, we must first go to the cross. You and I are sinners in need of a savior. But praise be to God for he has given us the mightiest of saviors (Philippians 2:5-11)! Philip Bliss penned these words in 1875 as he thought on the powerful verse in Isaiah 53:3 – He was despised and rejected by men; a man of sorrows, and acquainted with grief; and as one from whom men hide their faces he was despised, and we esteemed him not.